Say you’ve gone to the cinema to see a film but half way through you decide the film is boring. Do you get up and leave, or do you sit it out? I’ve read about this particular dilemma in two different books now. Freakonomics, by Steven D Levitt and Stephen Dubner, and then just this morning in Rolf Dobelli’s The Art of Thinking Clearly. According to research most people will stay and watch the second half of the film, citing the fact that they have paid good money to see the film as the reason, and according to both books this it bad reasoning. The Art of Thinking Clearly calls it ‘the sunk cost fallacy’. It is the same logical error that causes people to do mad things like not sell shares that are tanking or continuing with an expensive project that demonstrably not working. But both books also use the cinema example as a way of illustrating the idea. By the time you have realised that the film is boring you have spent your money. Leaving early and staying to finish the film are equal in financial terms. The only cost by this point is time. If you leave you save time. So leaving makes logical and economical sense, right? I’m not convinced. This argument assumes that there are three factors in play. Money, time and fun. Don’t get me wrong, if these were the only factors then I would agree, but I don’t think they are. It’s a bit of a left-field idea but maybe there is value in being bored. Not all the time, that would be awful, but occasionally perhaps. When I was at college I watched a film called Jean Dielman. I’m pretty sure I have mentioned it here before, but in short it is approximately three and a half hours long, is about a woman’s dull daily routine, and is shot in almost-real time. There is little camera movement, few close-ups, no cutting from angle to angle. In one scene she peels potatoes in silence and in a single, long take, that is what the audience watches her do. At the start of the film the room was full of my class-mates, by the time it ended I was one of only a few who had made it all the way through. There is a little more to this film than just long, slow scenes of her queuing in the post office and things. By watching for so long her routine reveals itself, which then, later, allows us to see how the routine starts to break down. There is genuine tension when she lays the table and puts a spoon in the wrong place. The impact of her unraveling life is dependent on the audience having gone through the tedium with her. The films strength is in the way it bores the audience. Is our time so valuable that we can’t spend a little of it being bored? At least then we can criticize it intelligently. When someone tells me they hated a film so much that they only watched half of it, that feels like only half an opinion. I have struggled my way through some pretty boring books in my time, and come the end, whether I enjoyed them or not I am glad I stuck with them. Sometimes they live with you in ways you weren’t expecting, sometimes you still hate them but have a clear idea of why. I wouldn’t criticize someone for walking out of the cinema halfway through, they might end up doing something amazing with that hour of their life, but I suspect that, on the whole, we take that hour and waste it like so many of the others. Mostly we look to films and books to entertain us, and its not unreasonable request. But beyond the time and money we spend in doing so, there are other hidden, potentially surprising, rewards waiting for us. That misplaced spoon was a very exciting moment. 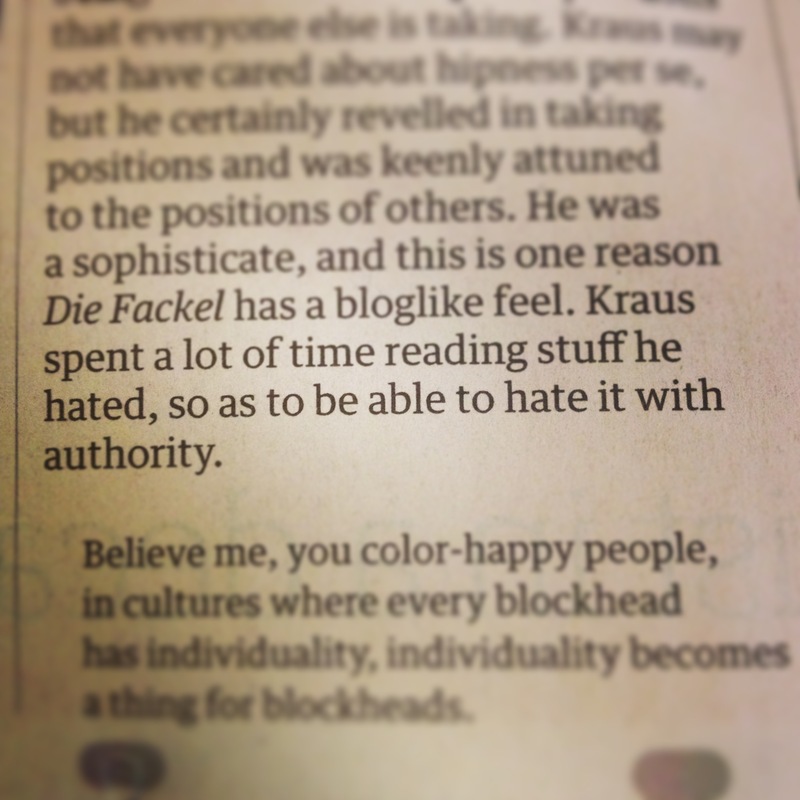 15/09/2013 – A few days later this line appears in the Guardian Review supplement. Seemed in keeping with what I wrote here so I thought I’d tack it on.